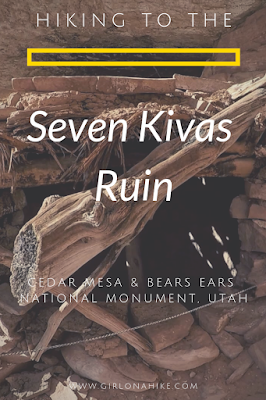 The Seven Kivas Ruin is located in Cedar Mesa, off Cigarette Springs Road. 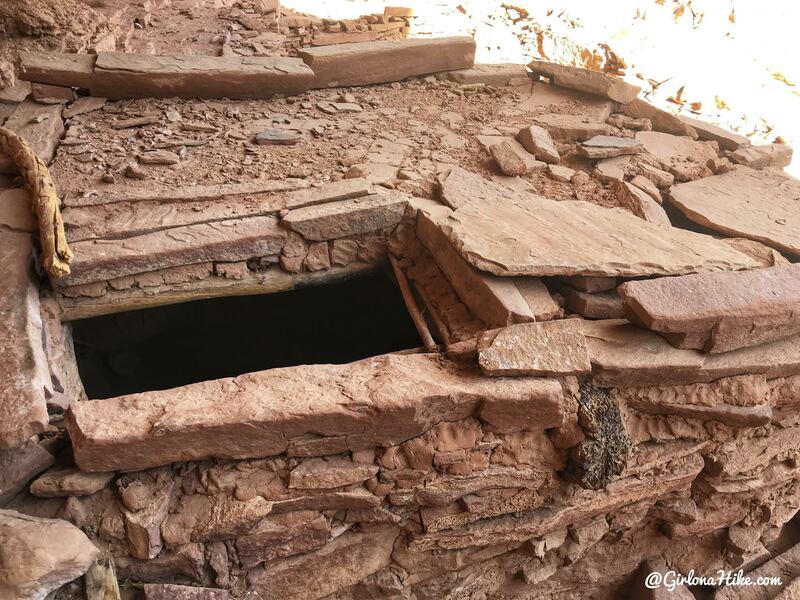 A kiva is a subterranean ceremonial chamber, and have been central to Native spiritual traditions since ancient times. The interesting thing about kivas, is that one of them could serve a single family. 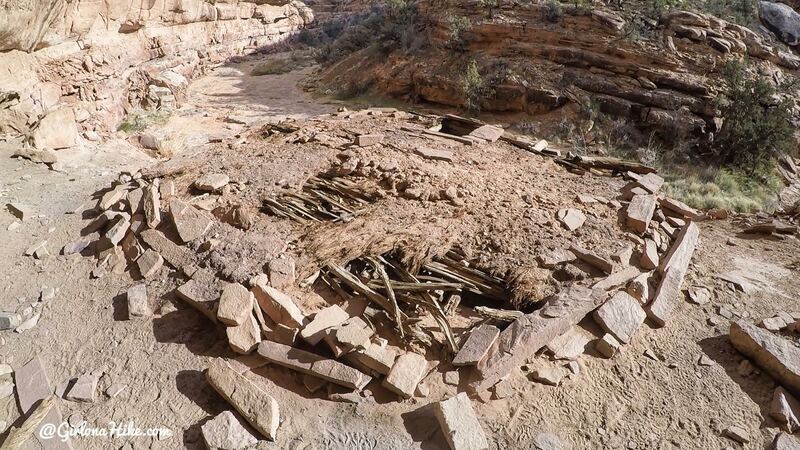 To have seven kivas in one area meant this site was used for something very sacred. There are very few ruins in this area, so when a ceremony would happen, families would have to travel far to reach this site. 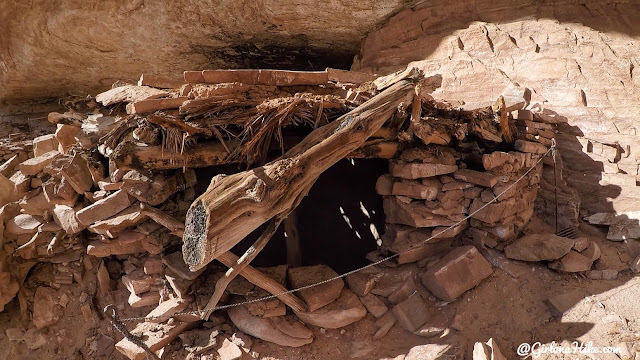 The other interesting part is that these kivas are located under a shallow, exposed alcove - exposed to the harsh weather conditions. 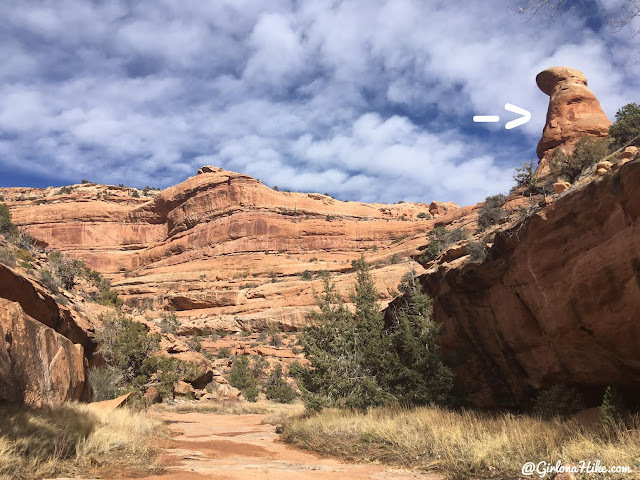 In the bottom of each kiva was a sipapu, or small hole or depression which symbolized the portal through which the original humans first entered the world. With so much history behind this area, it's a short hike to reach it. 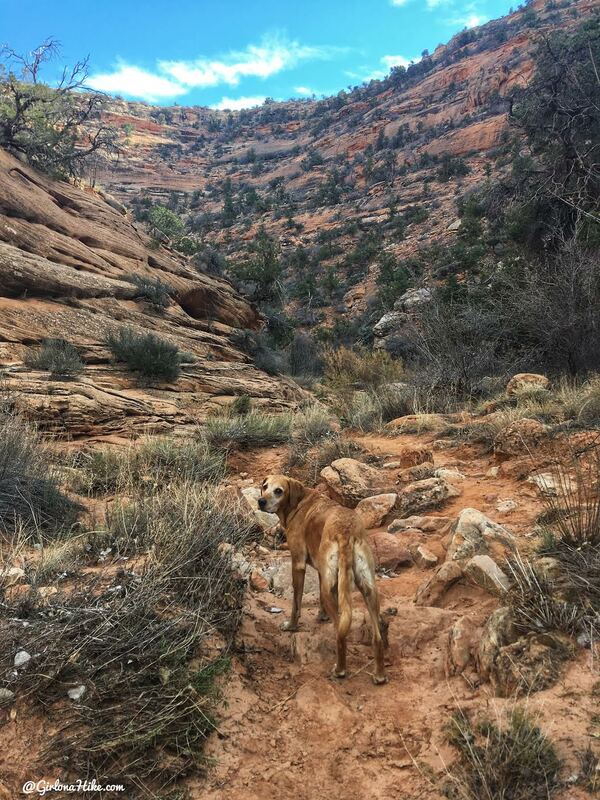 The more popular route is to hike the entire length of Road Canyon, but we took the "short cut route", shaving off 6 miles. 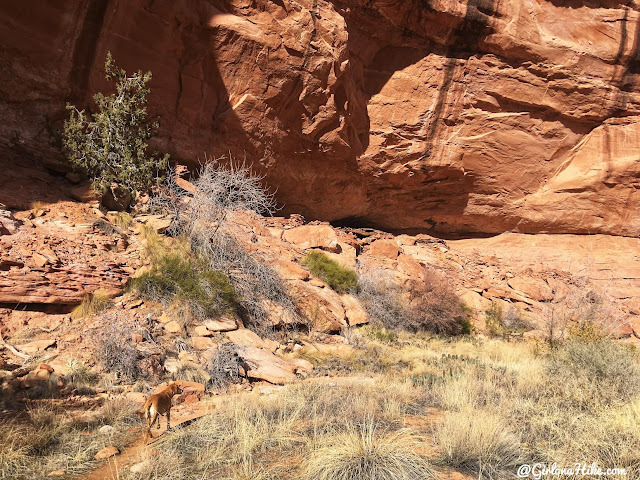 You'll first hike down ledge after ledge, following cairns, to reach the bottom of the canyon floor. This is the hardest part, especially on the hike back up. You will drop 500 ft. The next mile is very easy as you simply follow the trail until you see Seven Kivas, on the south facing wall. 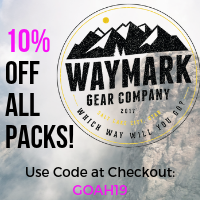 Fees/Permits? $2 per person/per day use fee. No permit needed. The end of the road and parking area. 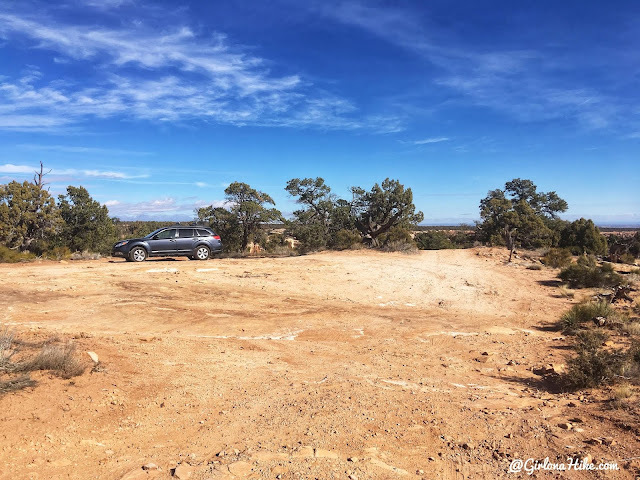 You'll see a brown hiking post to the far right in the parking lot - this is NOT the trail for Seven Kivas. 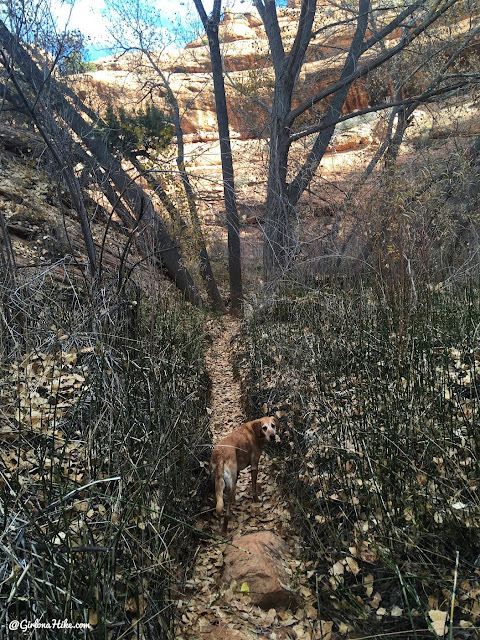 That trail leads to to another ruin (blog post coming soon)! What you want to do, is hike directly North, behind that car. You'll see some cairns that immediately drop down about 20 feet around a dry pour off area. Follow the cairns down to this dry pour-off then continue NE. You'll also see cairns heading South - do NOT take those. You'll get cliffed out. 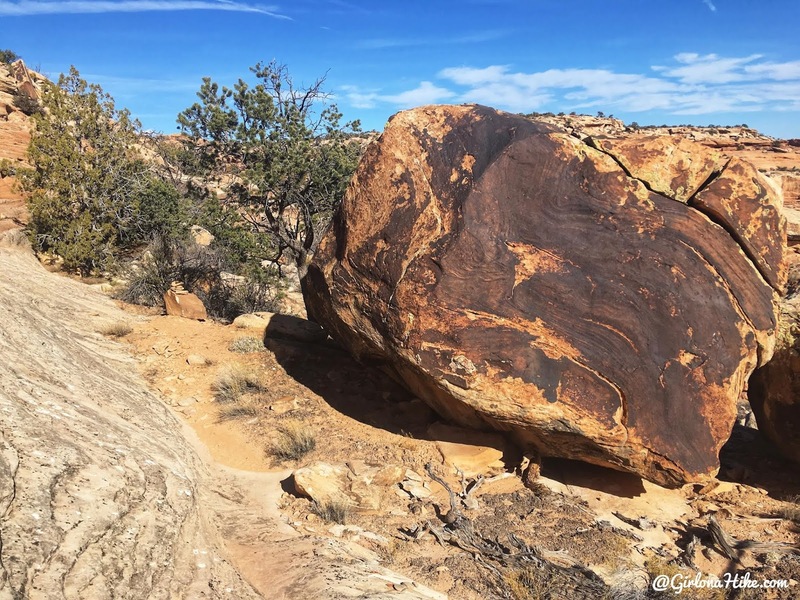 As you round the first bend, just after dropping, you'll continue North and pass a large boulder with a dark stain. The cairns were really easy to follow, as you drop 500 ft down the ledges, making small switchbacks. 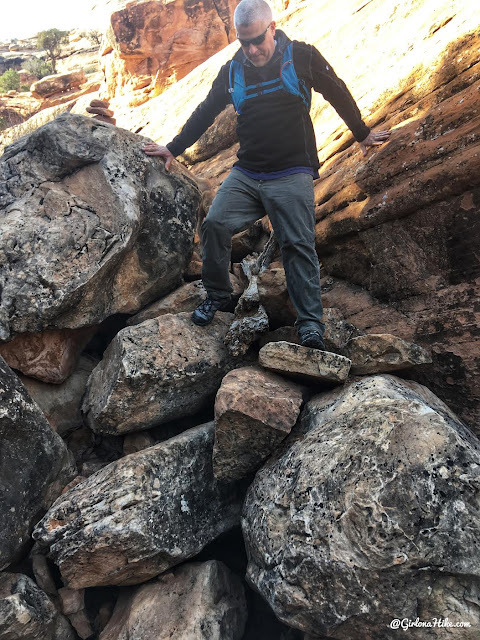 One small scramble down over boulders. The cairns will lead you to another dry pour off with a grey stain. 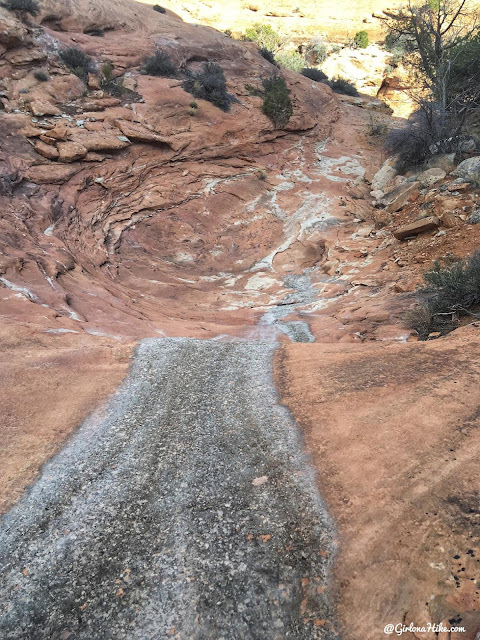 Hike straight down this. Finally, at the canyon bottom of Road Canyon. 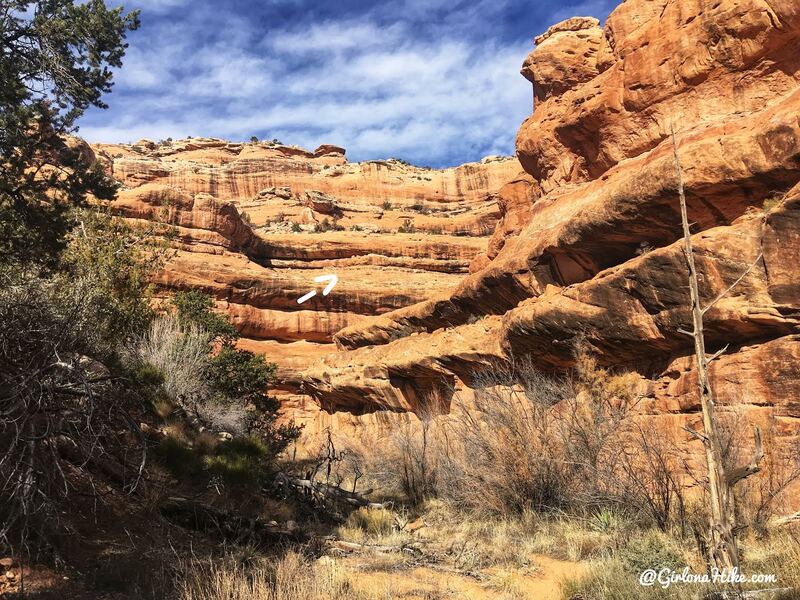 Take note of where you entered the canyon here, so you know where to exit on your way out. For us, there were two large cairns. 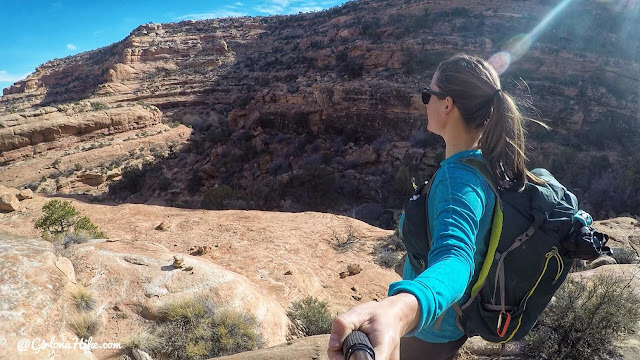 Once at the canyon bottom, continue right (East). 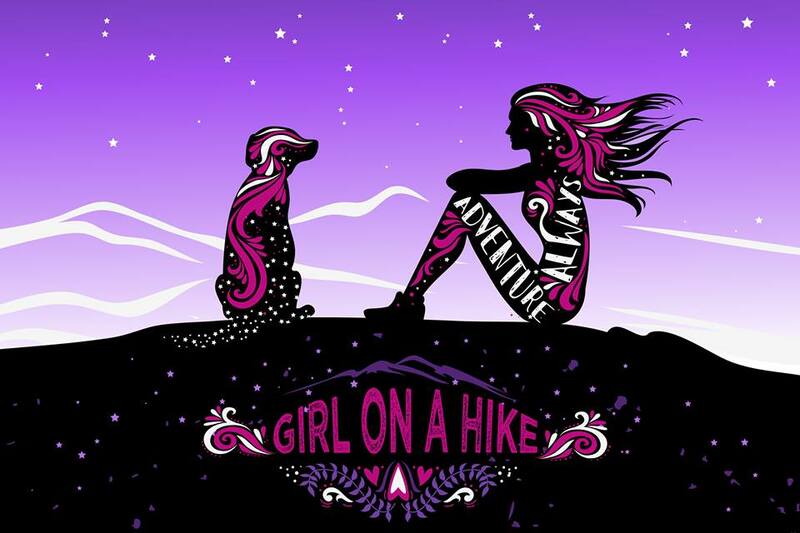 You'll hike through some vegetation, and the trail is very well traveled. As you turn around the first bend, look up! There are two ruins sandwiched into the ledges. It's hard to see in photos, so I highly recommend carrying binoculars with you. You'll soon hike through a narrower canyon section. The white stuff is actually frozen pools of water! We were able to crack it a little so the dogs could take a drink. Keep an eye out for this large single, bulbous rock on your right (south). 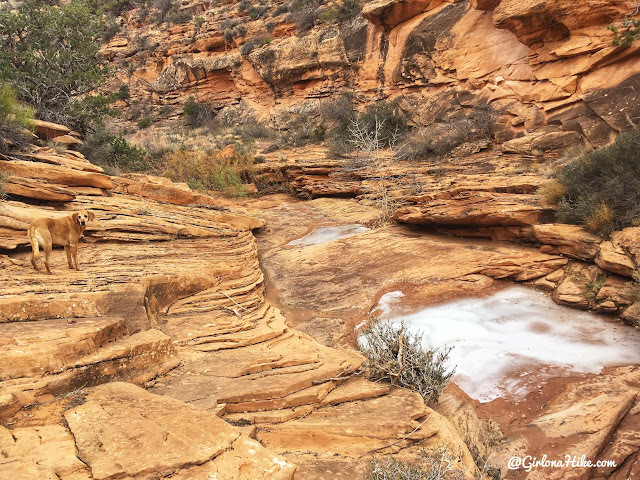 Seven Kivas is just around one more bend. At this same spot you'll see a left fork - there is a large alcove on a West facing wall but no ruins remain here. Just past the bulbous spire, you'll see a small alcove on the south facing wall. 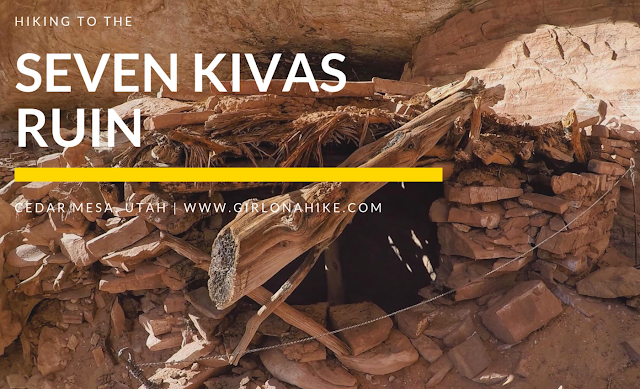 This is your destination - Seven Kivas! The entrance to walk around the site is on the far East end. Wow! 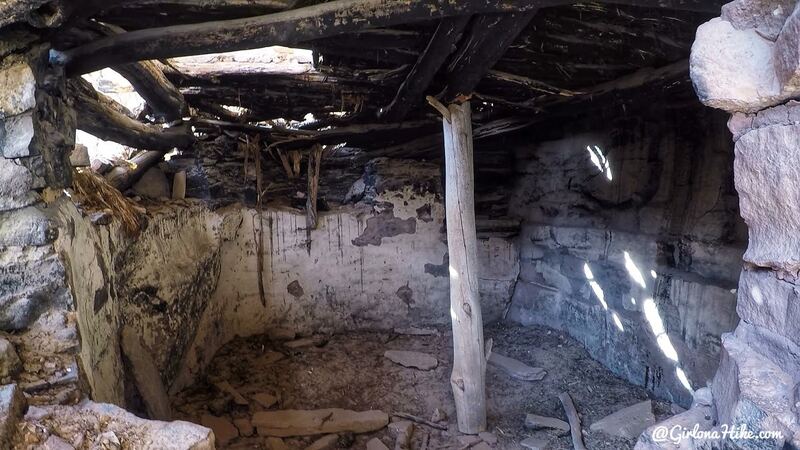 Amazing that the roof of two kivas was still present. I always wonder how the people were able to fit through these tiny holes to get inside. A look inside. Pretty well made for 800 years ago! I was able to stick my GoPro up close to look inside, but of course, you are not allowed to touch anything or go inside the kivas. Another kiva with a roof still remaining. We absolutely loved these ruins! My GPS went a little off here. It shows the ruins on the North facing wall - it's actually on the South facing wall at this same spot. 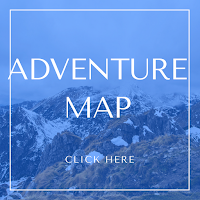 Terrific, beautiful, tour of your adventures! 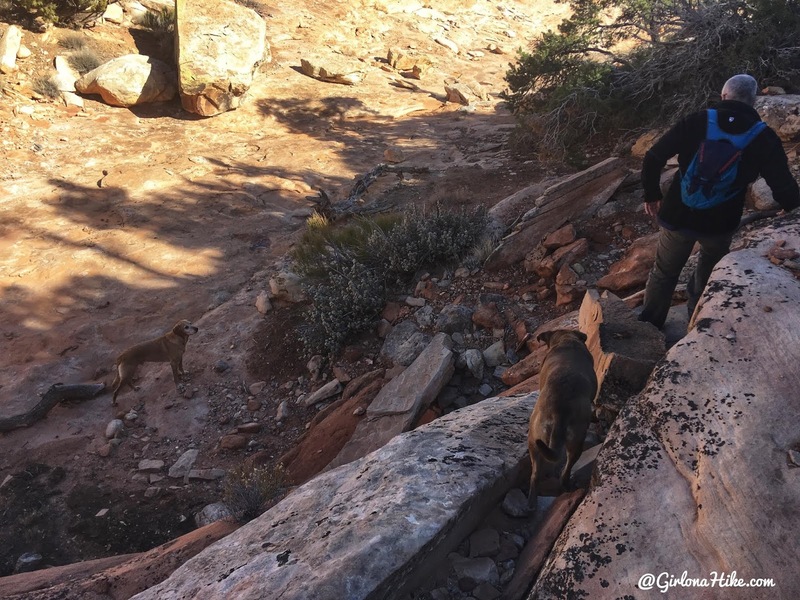 We thoroughly enjoy, and appreciate your sharing of your travels! 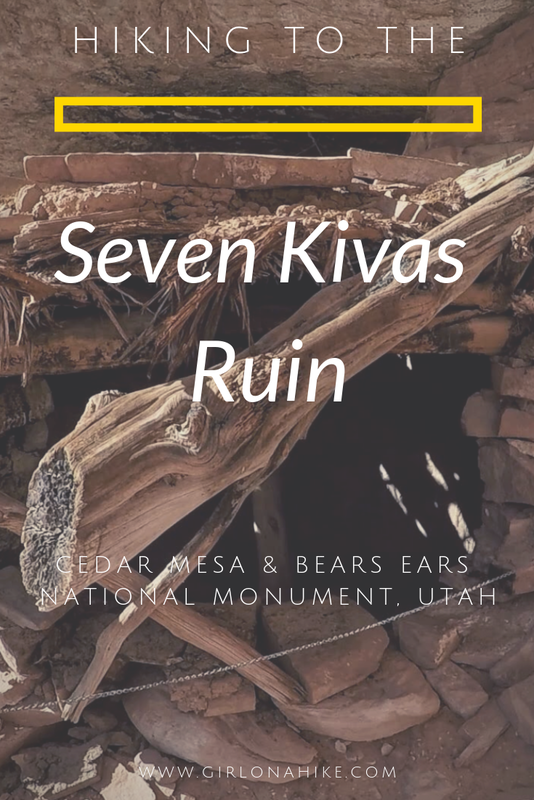 Seven Kivas is still on the list. We are working our way through the various ruins out Cigarette Springs Road. We have been to Bluff the last four years and stay for a week to ten days. 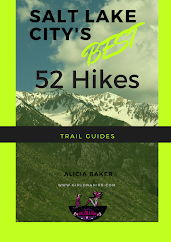 I still have ruins on the list that we need to hike to. Great directions!! Have you been to the Perfect Kiva out Bullet Canyon? Nice. I have not been to Bullet Canyon. 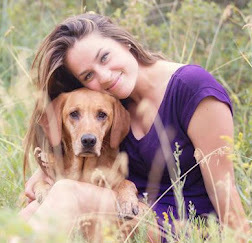 Since dogs aren't allowed there I probably won't go for awhile. One day, though! 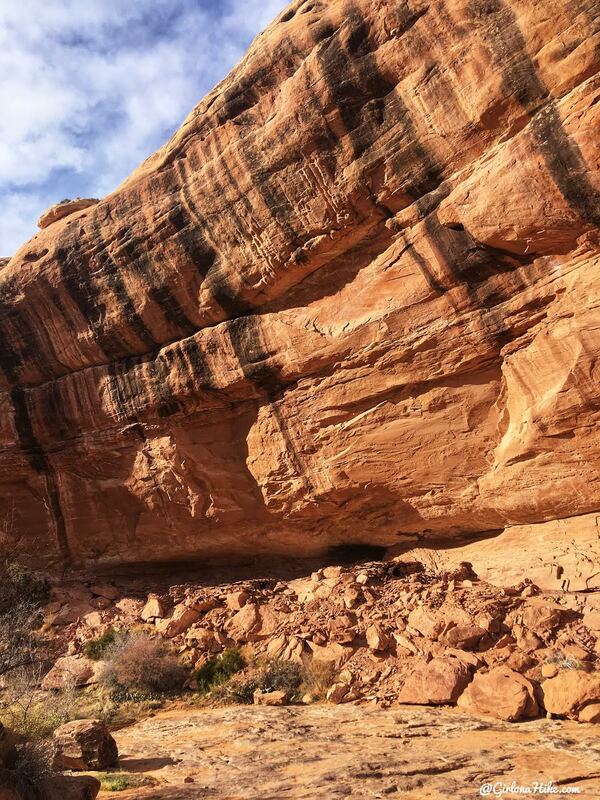 Next trip down here I'll do Arch and Lime Canyon.